No matter what sport, a strong core is your essential base for effective performance. The core is the central trunk of your body and is involved in every movement you make, as well as being decisive for good posture and protection of the spine. Not only does a weak core increase the potential for injury, but it also impedes performance and can negatively impact your hip and shoulder mobility. Many people still think of the ‘core’ as a fancy name for their ‘abs’, but it’s much, much more than that. The core consists of the abdominal muscles that are too deep to see in the mirror. It is your back, your lats, your hips and your core keeps you stable. Your core is connects your entire body from the ground up. Exited for more? Let’s have a look at three exercises, from three pieces of iron kit. that will result in an iron core and explosive power! Kettlebells offer an incredible opportunity to train the core from head to toe: The movement is free and functional and the whole body is involved, with many muscles being trained simultaneously. You do not only lift the kettlebell, you also have to compensate the weight using your body and maintain balance. The Turkish Get Up is a complex and useful exercise. It involves so many steps and movements that you train your whole body with only one exercise. Depending on your exercise equipment, you start in supine position handling the weight of your gear safely. The leg on the side of the weight is angled and the opposite arm and leg are set at 45 degrees to the midline. Roll up from the side to your elbow. Next step, sit up and bring your free leg under your body. Straighten your torso and rotate the lower leg on the kneeling side backwards. Stand up fully from this half-kneeling level. From here go back down to the starting position. HOW CAN SWINGING WEIGHT IMPROVE YOUR CORE STRENGTH? Conventional weight training can only be moved in one or two dimensions. 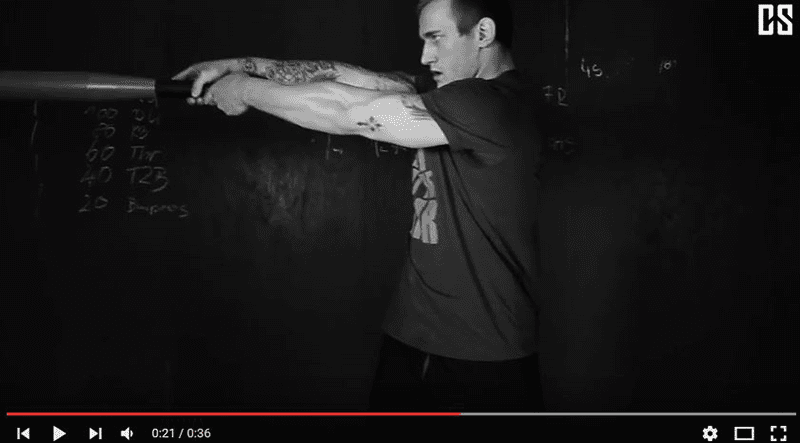 This limited range of motion attempts to isolate particular muscles. Clubbell training is tri-planar: moving through the sagittal, coronal and transverse planes. By moving tri-planar, the Clubbell strengthens the fascial chains across the web in their full range of motion. This increases soft tissue elasticity, rather than traumatizing it like one or two dimensional movements in conventional weight-lifting. Clubbell workout is specifically designed to connect the superior force production of torque to one’s core. The Clubbell is truly an extension of the body. Furthermore, all exercises are intensive for your full body: creating incredibly powerful glutes, hams, quads and calves from the leg drive. Even Robert Downey Jr. used this workout to get in shape for ‘Iron Man 2’. Bored of traditional weight lifting training, his fitness coach created a pretty unusual workout for Downey Jr. using exercise equipment such as a gym-hammer, car tyres and self-made barbells constructed from bamboo. The goal is simple: Hit the tyre with the gym hammer 10 times per minute. Take a short break for 1-2 minutes. As soon as you made 10 rounds with a one minute break, the breaks are reduces by 10 seconds. Then you have 50 seconds breaks which will be reduced till you can do all 10 rounds without having a break. Do you know the funfair game high striker? Take inspiration from that. Have fun!